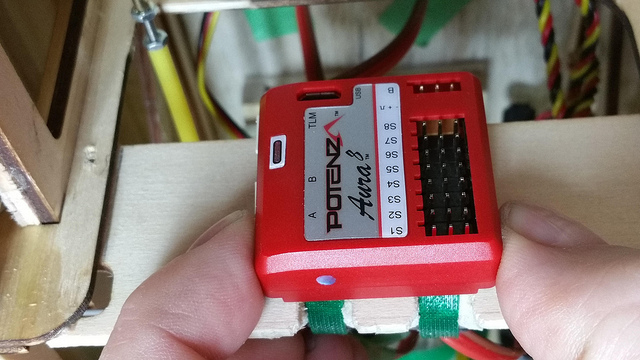 Last spring I installed an Aura AFCS in my H9 Pulse 125 and it made a big difference when flying in the wind. This winter I had repairs to make on my GP Super Stearman and when it was on the bench I installed an Aura 8 in it too. Last time I did it with PWM connections (http://www.grosbeakrc.ca/aircraft/pu...o.html#connect. 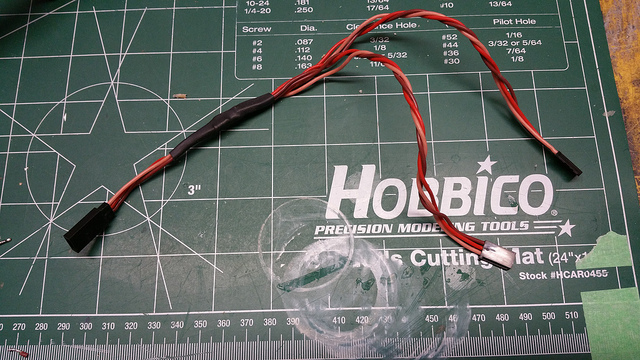 This time I upgraded the electronics in the plane to digital servos for the control surfaces, and an S.Bus receiver. 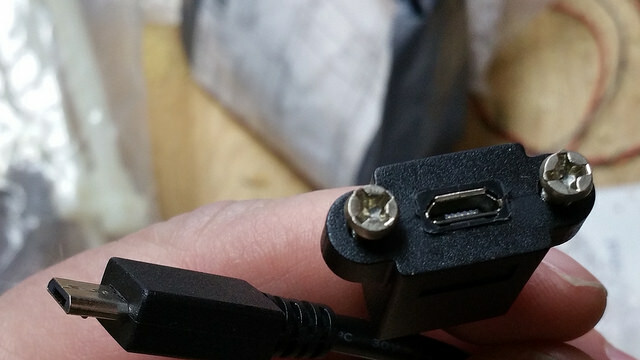 This means a single connection between the receiver and the Aura 8. Here's the location I chose for the Aura 8. It's on the other side of a plate from the receiver, with the pins on the right and facing the rear. The Aura 8 can be placed in any orientation as long at it's right angles to the direction of straight and level flight. 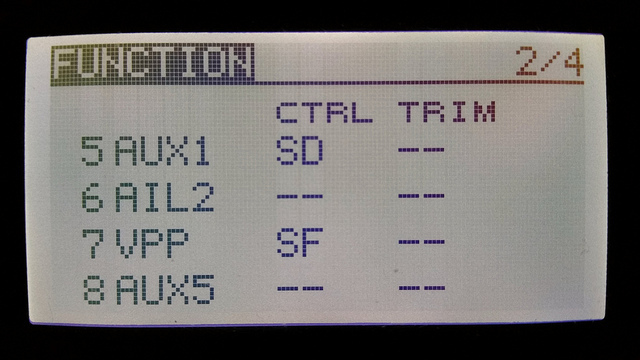 The orientation is set up in the Aura 8 config tool... Details later. The Aura 8 should be directly supplied with power. I made a Y cable to share power between the receiver and the Aura 8. The Aura Config Tool is a PC app. Your tablet or laptop connects to the Aura 8 by USB. 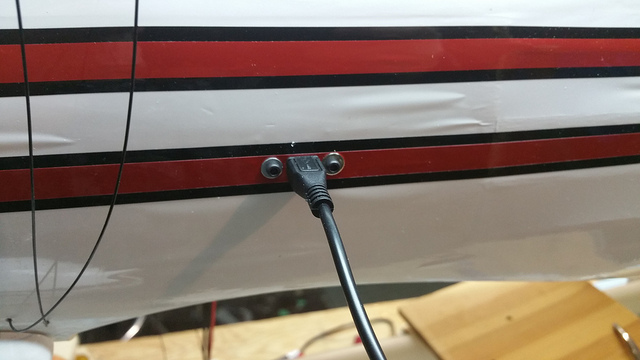 I don't want to take the wings off to connect, so I bought and installed a female-to-male panel mount cable. The Aura Advanced Flight Control System (AFCS) is designed to offer an optimum flying experience when installed properly. For optimal flying experience, the Aura does a few things different than a traditional gyro or flight controller and handles some duties that are traditionally handled by the transmitter. 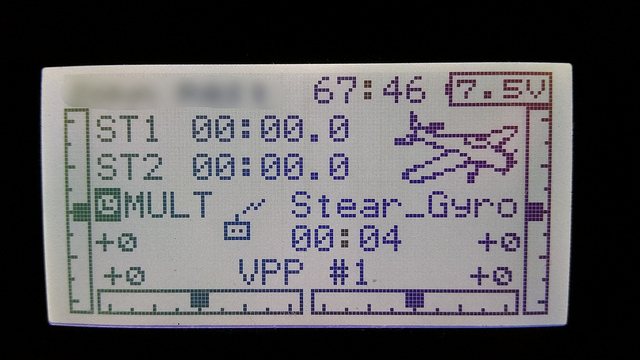 The concept of an on-board configuration means the best flying experience is achieved when many parameters are set on the Aura, rather than in the transmitter. 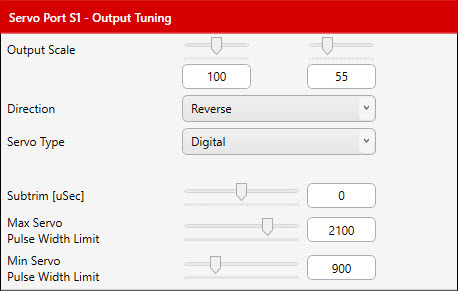 For best results the following items are best configured in Aura: Wing and Tail types, Servo Reversing, Servo Travels, Sub-trims, Trims, Dual Rates, Exponential Setting. 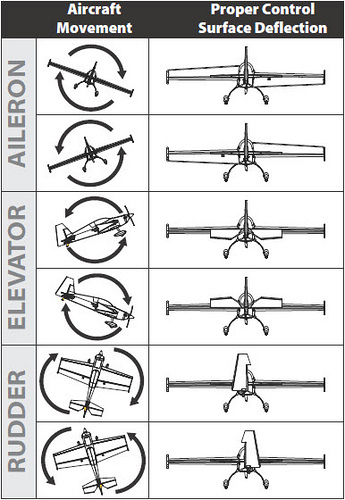 This table (also from the User Guide) is a handy reference when setting up the transmitter. 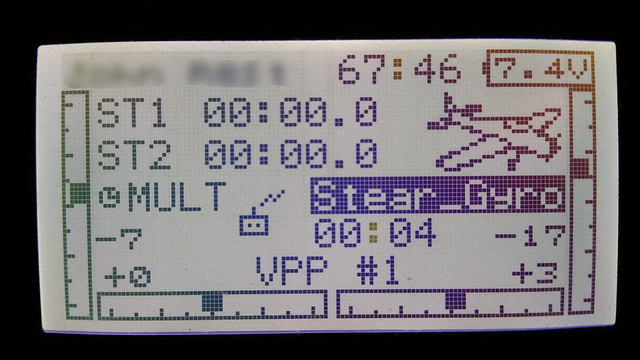 I start programming the transmitter by creating a copy from the existing airplane's profile. And set the dual rates for all control surfaces to 100% with zero expo, for both high and low rates. 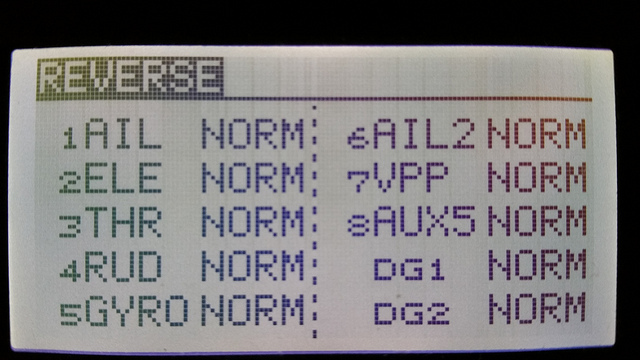 The next steps were done in the Aura 8 Config tool. I started as usually by choosing File > New Aura Config Wizard And selecting Aura 8 Open Stock when prompted. 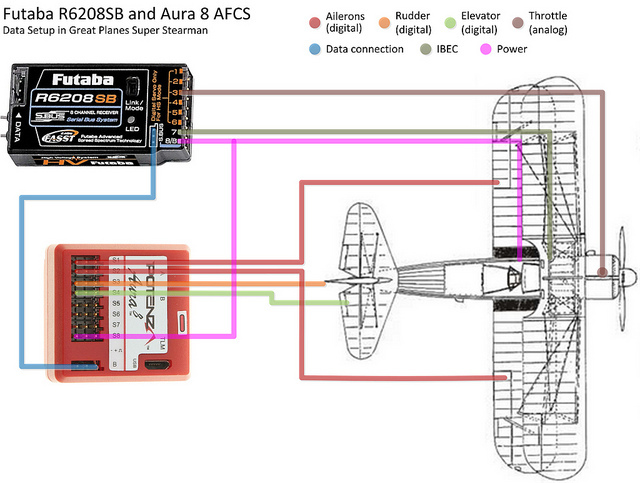 On to the initial configuration for the Stearman - note that the orientation of the Aura 8 is set to match its position in the airplane. The connecting rods between the upper and lower ailerons prevent the lower ailerons from full downward deflection, while causing strain to the rods, ailerons and servos. In the original setup before the Aura 8 the problem was easily solved by setting Aileron Differential in the transmitter, which limited downward travel. 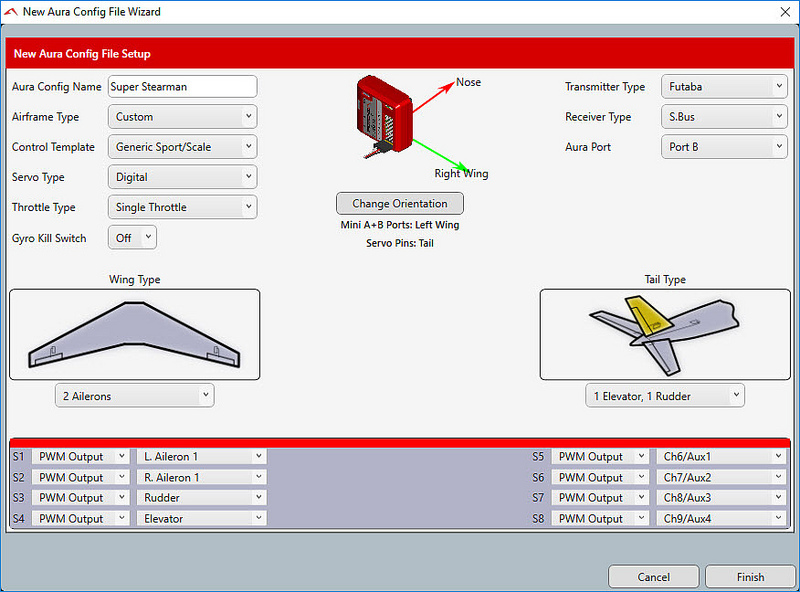 In the Aura Config Tool there is no dedicated aileron differential function, but it can be limited in the Output Tuning dialog box on the Servo Ports tab (note that Advanced View must be chosen from the View menu). Here are the setting for the port aileron. Starboard was much the same: 100% up and 55% down. Even after adjusting the linkages for minimum throws it was necessary to restrict the elevator and rudder elevators (shown respectively) in the Servo Port tab's Output Tuning dialog box. 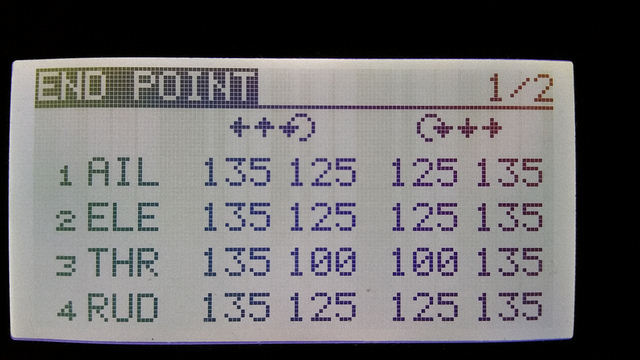 This is similar to setting end points in the transmitter. 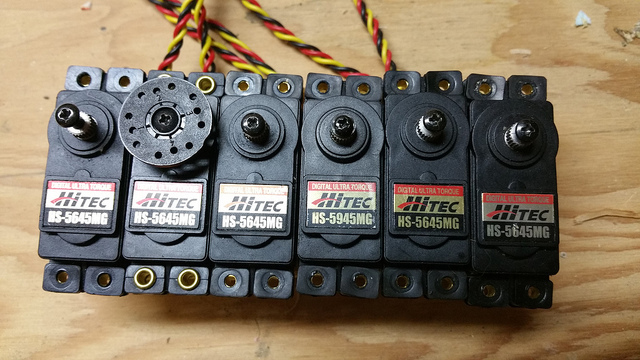 Note that servos can be reversed here as well. I start with the default expo settings for all flight modes, though I bring a tablet for my first few flights in case the settings need to be changed at the field. 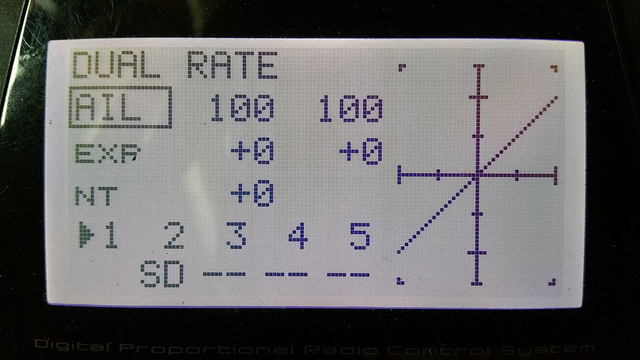 By default rates are controlled by channel 5, which I linked to the transmitter's 3-position switch SD back in post 3. Testing the installation is a matter of turning on the airplane's power and moving the airplane in both directions for each of the three axes of flight to ensure there is a slight corrective control movement. For instance, if you yaw the airplane to the left should see a slight rudder correction to the right. The Aura 8 Quick Start Guide provides this handy visual reference. Now to wait for spring so I can fly it, tweak it, and fly it some more. 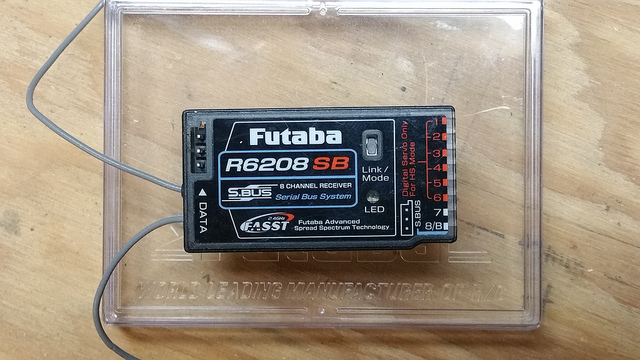 I’ve been sitting on a new one in a box for a couple years along with a Futaba 7003 receiver. 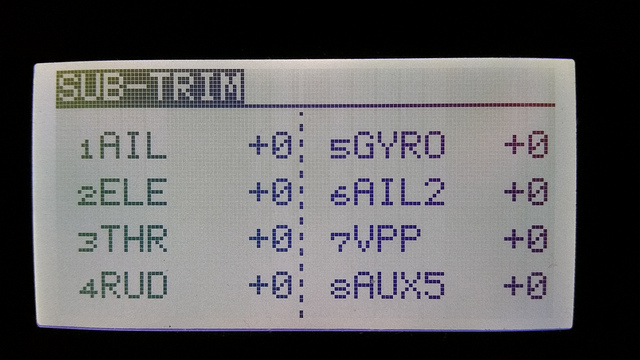 It’s cool that this thing does all the gyro stuff as well as using the bus to epand to 8 channels. 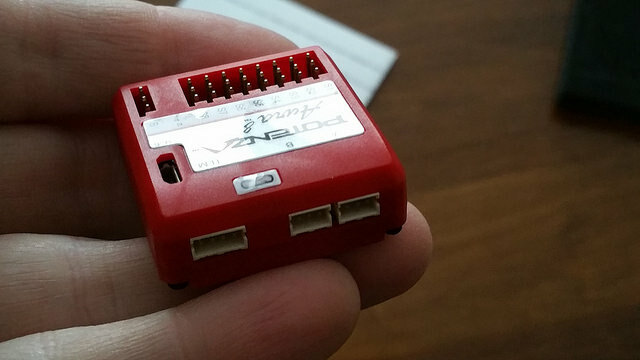 This thread might just give me the inspiration to put this thing in a aircraft!